A senior researcher has accused the UK government of using "fake science" to justify its policy of culling badgers to control cattle TB. Prof Rosie Woodroffe has told BBC News that ministers were creating an "illusion" of success to justify the policy. Ministers say their approach is supported by government scientists and leading vets. Prof Woodroffe, a wildlife expert at the Zoological Society of London (ZSL) who carried out the scientific assessment of culling badgers to control Cattle TB on which the current policy is based, said the government risked losing trust on how it used evidence - not just on its policy on controlling cattle TB but also on other important scientific issues. "When evidence is being cherry-picked and presented in the best possible light, it ceases to be evidence. It is fake science. "When it comes to (other policy areas) such as climate change and bee pollination, issues that have a big impact on lives and livelihoods of people, it is important that we can rely on the government to provide good evidence that stands up to scrutiny." A spokesman for the Department for Environment, Food and Rural Affairs (Defra), which oversees the badger cull, responded: "England has the highest incidence of TB in Europe and that is why we are taking strong action to deliver our 25-year strategy to eradicate the disease and to protect the future of our dairy and beef industries. "Badger control in areas where TB is rife is one part of our long-term plan, which also includes strengthening cattle testing and movement controls, improving biosecurity on farm and when trading, and badger vaccination when possible." Defra has overseen the issuing of licences to cull badgers in 10 areas in South West England to reduce the incidence of TB in cattle. The first culls began in 2013 in two areas in Somerset and Gloucestershire amid criticism from many scientists that the policy would at best have only a marginal effect on the spread of the disease and possibly increase the spread of TB. The critics' comments stem from an eight-year trial carried out by Prof Woodroffe in the 1990s which showed that only sustained and coordinated culling of badgers can slow down the rate of increase in cattle becoming infected with TB in the immediate area. Since then Defra's own monitoring has concluded that it has killed enough badgers in its pilot culls and has rolled out culls in eight more areas. The department will also announce up 10 more areas later this year. "Where few badgers were being killed, they lowered the targets; where a lot were killed, they raised them. This means that there is really no way to tell what reduction in badger numbers was achieved by these culls. 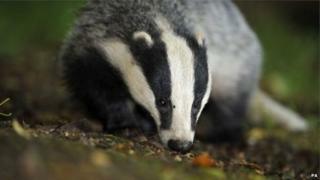 Culling that was consistently ineffective would look like a low badger density and prompt a reduced target," she said. Prof Tim Coulson, of Oxford University, who was a member of the Independent Expert Panel (IEP) that assessed the pilot culls, agrees. "The IEP developed robust methods for assessing effectiveness. Defra has chosen to ignore these. My hope is at the end of this there is a proper independent review and those who have deliberately chosen to ignore the science and pursue an expensive and ineffective agenda on political grounds are held accountable. "It is not helping the poor farmers. It is costing the tax payer millions. The science has already been clear, but science no longer plays a part in the decision process." "Daily data collected through the course of the cull will allow Natural England to assess whether the estimated population was a reasonable reflection of the true population. If there is evidence on the ground during culling operations that suggests the minimum and maximum numbers have been set either too low or too high, Natural England can adjust the figures accordingly." The rock musician Brain May, who campaigns against the cull, is among the organisers of Tuesday's scientific symposium. He said he hoped that it might be possible for all parties to reach a scientific consensus. "Everyone is sincere in their views but they are diametrically opposed based on the same body of data. My view is that it's because there are all sorts of other factors in there: there is a political element, there is an emotional element, as well as an intellectual element; and unfortunately it has become very hard to disentangle all these. "The aim of this conference is to try to clear that out of the way and look honestly, and, if possible, without prejudice at the information that is in front of us."